Lightweight and soft, Crusher Mini-Lite Balls are the size of a golf ball but can be hit in the garage, backyard, gym or at the ballpark. The balls are colored optic yellow and formed to look like miniature pitching machine baseballs. 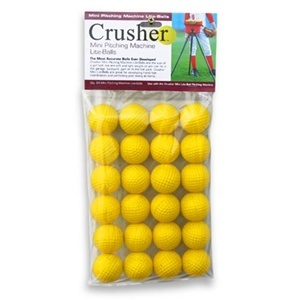 The balls are great for developing hand/eye coordination and perfecting your swing at home.